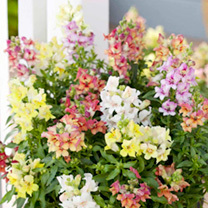 So named by the breeder because of its unique lemon scent, this bushy, upright variety boasts upward-facing flowers in a host of unusual colours. Ideal for bedding or containers, with a longer flowering period than most antirrhinums. Height 30cm (12”). HHA/HHP - Half hardy annual/Half hardy perennial but best grown as an annual. Sow in a propagator on a windowsill or in a greenhouse at approximately 15-20ºC (60-68ºF), using a good quality, finely sieved, moist compost, sowing the seed lightly onto the surface. Do not exclude light but maintain moisture (germination 10-20 days). Transplant seedlings, spacing them out 5cm (2") apart in seed trays and grow on. Plant out 41cm (16") apart late May/June in a sunny position. May also be sown July-September in a coldframe and planted the following spring for early summer flowering. Ideal for beds and borders, patio pots and containers, greenhouse. Scented. Suitable for cut flowers. Attractive to bees. Prefers full sun. Add height to the back of your border or in the centre of your pots.